Warner, Khawaja Star as Australia Makes Sizzling Start to Summer. Australia won the toss, elected to Bat first. 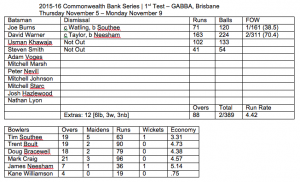 The opening day of the International summer from the GABBA. It has become tradition, with the Queensland venue back in its rightful spot as the host of the opening test of the summer for the first time since 2013, after last year’s reshuffle following the tragic passing of Phil Hughes saw the GABBA test become the second of the season. Today, it’s the finalists from the Cricket World Cup, Australia and New Zealand doing battle in the first of three Tests in the battle for the Trans-Tasman Trophy. This series will take us from the GABBA, to the WACA, and then on to the Adelaide Oval for the historic day-night Test Match. It’s all part of a terrific summer of Cricket, with the West Indies coming out for three Tests in December, before the Indians come to town for the 5-match ODI Series and 3 Twenty20’s in January. But, it all starts here at the GABBA, where Australia are undefeated since 1989, and New Zealand last won in 1985… 30 years on, they’ll be hoping to mark that anniversary with a win, and the series lead, ahead of the trip west next week. Not an ideal lead-up for them however, after their scheduled tour match against a Cricket Australia XI in Blacktown was abandoned before the Blackcaps even had the chance to bat. The Cricket Australia XI declared at 1/503 after 121.1 overs, but a dreadful and deteriorating pitch at Blacktown saw Officials deem it too dangerous to play on, and with the fall of that first wicket on 503, there was no further play. Prior to that, New Zealand were smashed all over the park by Aaron Finch (288*) and Ryan Carters (209). In their other lead-up matches, they enjoyed three days of Cricket in Canberra, defeating the Prime Ministers XI by 102 runs on the Friday, before playing a 2-day game against the Cricket Australia XI on the weekend of October 24-25, and that was a draw. 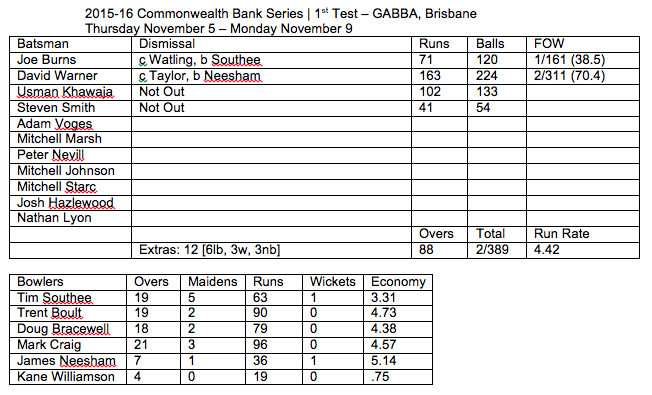 So, with that, the next stop was the GABBA, and their long run of conceding runs without taking wickets was set to continue, as the new Australian Captain Steven Smith won the toss, and elected to Bat first, on what was a greenish deck in Brisbane… Brendon McCullum has said that he wouldn’t losing the toss given the opportunities that would come as a result of the grass on the pitch IF his bowlers performed well. It’s a new look Australian team as well, with Steven Smith taking over from Michael Clarke as captain. As we suspected, Chris Rogers retired at the end of the Ashes series, with Joe Burns taking the place vacated by him as opener alongside David Warner, and Peter Nevill has been retained as wicket-keeper, after taking Brad Haddin’s place part way through the Ashes tour. Due to the schedule two-test tour of Bangladesh being cancelled due to safety concerns, this is Australia’s first cricket since the completion of the Ashes tour, where they won the limited-overs series, but lost the urn to England on English soil for the fourth time in succession. It was a tight contest for the first hour, as David Warner and new opener Joe Burns settled in, and got their eye in against the new ball. The New Zealand bowlers kept it tight until drinks, with Australia only putting 36 runs on the board. After drinks, the openers hit the accelerator, with Warner notching up his fifty just before lunch, and Australia going to the break at 0/100 in just 25 overs. In the 20th over, Warner survived a DRS challenge from the New Zealanders. Warner was struck on the pads, and given not out by the umpire, leaving the Blackcaps to use one of their two challenges. Sadly they lost the challenge, as the ball was pitching outside Warner’s leg-stump, and the original ‘not out’ decision stood. Shortly after lunch, Burns reached fifty, as he and Warner continued to pile on the runs. The partnership reached 161 before Burns edged one to BJ Watling, who took the simplest of catches, and New Zealand had their first wicket of the series. Usman Khawaja returned to the Australian team for the first time in over two years, and he didn’t muck around once he took guard in the centre – racing to 30 before the tea interval, and at the other end, David Warner was outstanding in racing to his 13th Test Match Century, but his contribution was far from done, as Australia went to Tea at 1/222. Warner eventually fell on 161, after going for one too many, and Taylor took a brilliant catch. Steven Smith joined Usman Khawaja, who was sitting on his career best score by that point, with the team score past 300, and still 20 overs scheduled to be bowled. The fall of Warner didn’t slow scoring, nor really did the second new ball, as Khawaja made his way to his maiden Test Century just minutes before the close of play. Storm clouds loomed for the majority of the final session, but no rain hit the GABBA, and play went right through until 5:30pm local time as scheduled. Only 88 overs bowled in six and a half hours, which again indicates that over rates may be an issue throughout this series, but that won’t worry Australia tonight… brilliant start to the summer for them, at a ground that has become their fortress. All batsmen have made a start, including the captain, who’s now scored over 1000 runs in Test Matches this year, and has started this summer where he ended the last one… he’s 41 off 54 at stumps, and will be looking to continue on from that solid start tomorrow. The day however, belongs to David Warner and Usman Khawaja… Warner getting a century, after failing to convert his last seven half-centuries, and Khawaja scoring a maiden test match ton, in an innings he’ll never forget. 100 runs scored in the first session of 25 overs, 122 in the middle session off 29 overs, but it was the last session where the batsmen put their foot down, scoring 167 runs in 34 overs. Since the commencement of that controversial tour match against the Cricket Australia XI in Blacktown, New Zealand have conceded 3/892 in 209 overs. Their bowlers have struggled so far in these matches, and it’s continued at the GABBA, on what is a batsman’s paradise. Best of the bowlers so far is Tim Southee, but all of them will be hoping for some quick, early wickets tomorrow, without conceding too many more runs, because at this stage, Australia are heading for a declaration anywhere between the 500 and 600-run mark, which would be a formidable first innings total, and make it almost impossible for them to lose this match. Play continues tomorrow from 11am AEDST, 10am local time, and you can see it LIVE on Nine. Carrera Cup Returns to Hidden Valley in 2016.